ZBW Blog about Open Science, Information Infrastructures, Innovations and more. "Das war die Woche auf Twitter! https://t.co/TpTBbgWUee Mit Links von @RothsteinDan @dimevets @sqirlgirly #openaccess #libraries"
Except where otherwise noted, content on this site is licensed under der Creative Commons BY-NC-SA 4.0. Exchanging ideas, sharing experiences, talking about Open Science. The Barcamp Open Science is the ideal opportunity for this. 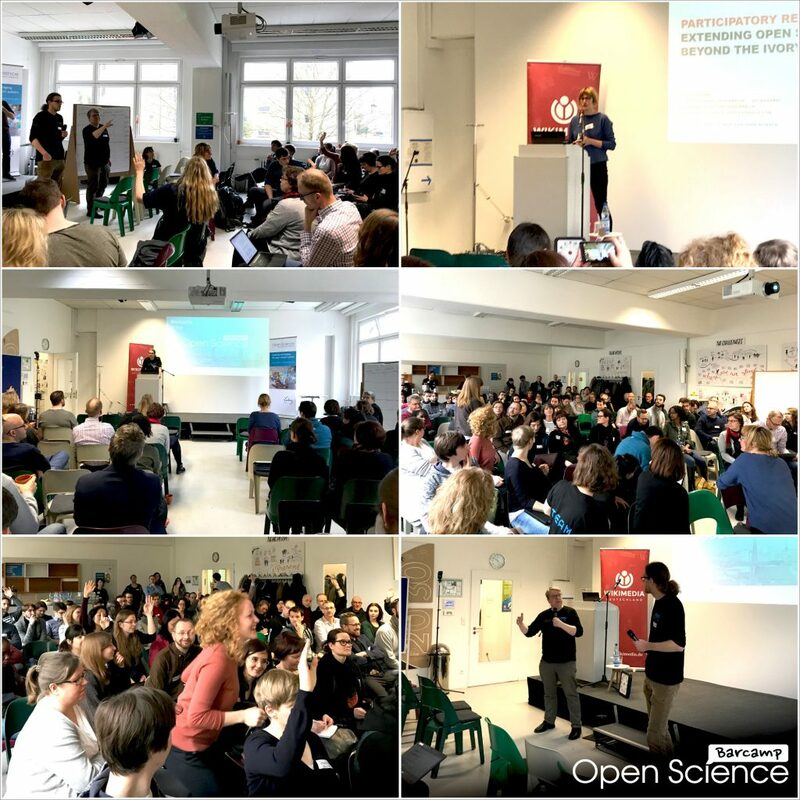 On 18 March it took place for the fifth time and showed the huge need for an exchange on Open Science and the further development of events for sharing learnings and ideas. Open Science is on its way to broad implementation, but this process is complex and lengthy. In order for a common Open Science idea to emerge and be implemented, exchange and networking are of central importance. The Barcamp Open Science contributes to this and offers a low-threshold platform for exchange across the entire spectrum of Open Science topics. This year it was once again evident that many participants used the sessions to discuss their burning topics. This event format was offered for the fifth time on the eve of the Open Science Conference, this year on 18 March. The event was organized by the Leibniz Research Alliance Open Science and hosted by Wikimedia. More and more participants of the Open Science Conference are taking part in this pre-event. Many of them came from regions outside the German-speaking area, some even from outside Europe, making the barcamp more international than ever before. Especially the exchange about Open Science on a broad scale and with international like-minded people makes the Barcamp Open Science attractive and unique. The fact that the barcamp was fully booked after less than two weeks shows that there is a huge demand for this kind of open event. Awesome to have a group of research data managers from @tudelftlibrary here at #oscibar – but also participants from Norway, Finland, the West Indies, Togo, Luxembourg, Greece and many other places around the world. An integral part of the Barcamp Open Science is the “Ignition Talk”, a short introductory lecture that “ignites” ideas for further discussions. This year Claudia Göbel from the Museum für Naturkunde in Berlin offered an insight into “participatory research” in her Talk “Participatory Research: Extending Open Science beyond the Ivory Tower”. This means the engagement of the public in the production of scientific knowledge. Claudia Göbel highlighted the diversity of this engagement and the various buzzwords under which it is summarized. Citizen science, do-it-yourself science or community-based research are different concepts that all attempt to describe the involvement of non-scientists in research. Especially during the last twenty years there has been a movement towards more participation of society in research. This is also where Open Science comes in, because in addition to internal scientific change, Open Science is also about including new perspectives by opening up to social actors. Claudia Göbel stressed that questions of power must be addressed more strongly in research. Participation alone does not strengthen research, it is about who can participate and in what way. “Who feels at home in this field and can make a contribution”. The sessions were as varied as the participants of this year’s barcamp. 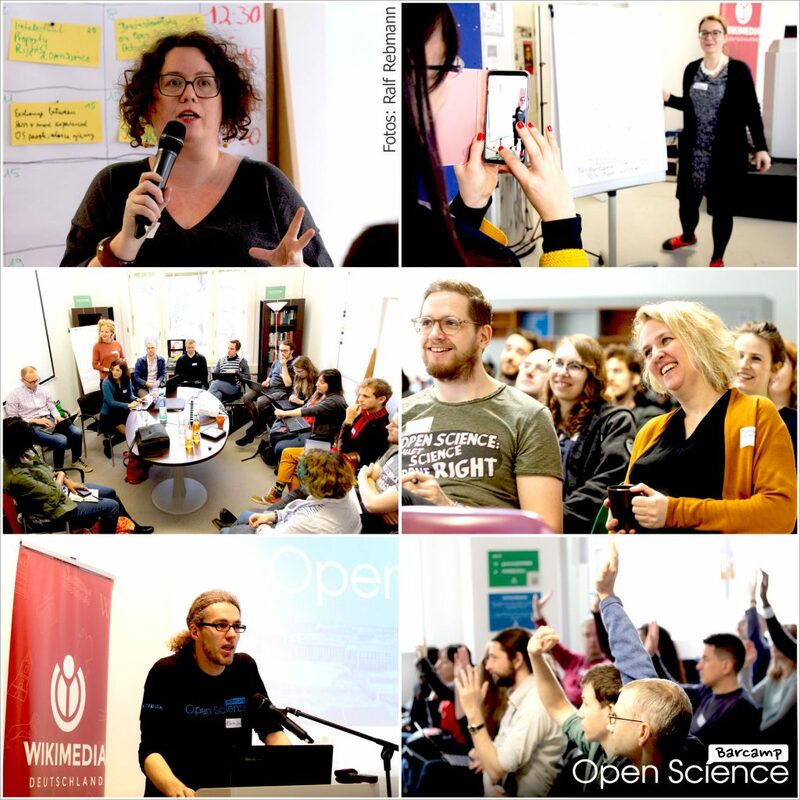 Many of the sessions focused on how to raise awareness of Open Science and the application of open scientific practices at one’s own institution, in one’s own discipline, or among colleagues. In addition to these transfer sessions, there were also some sessions in which practical tips were given, such as how to provide open citations or how to find suitable software for your own Open Science project. Personal experiences, goals, and insights were also shared, for example the frustrating moments Open Science enthusiasts can experience. This year, the event organizer Leibniz Research Alliance Open Science took the opportunity to offer two sessions on its own behalf. The editor of the Open Science discussion platform “genR”, Simon Worthington, offered a session to get feedback and ideas for the further development of the platform. GenR was launched in June 2018 with the aim of giving researchers an overview of Open Science and how different tools and practices can be applied in their own research. The discussion has shown that it is not enough to simply tell researchers they should practice Open Science because there are still too many reservations. Sometimes it makes sense to avoid the term Open Science at all and instead address researchers on issues such as reproducibility or efficiency. Unfortunately, Open Science still faces a lack of confidence. That’s why it is all about one thing: building trust. This is achieved through concrete and practical recommendations that work and bring added value. Which tools make sense, which publications should I look at, where should I store my data? This does not require a new community, but existing communities must be integrated in order to build up trust there. In addition to researchers, institutions should be approached so that they, as trustworthy partners, act as multipliers to their own local communities. 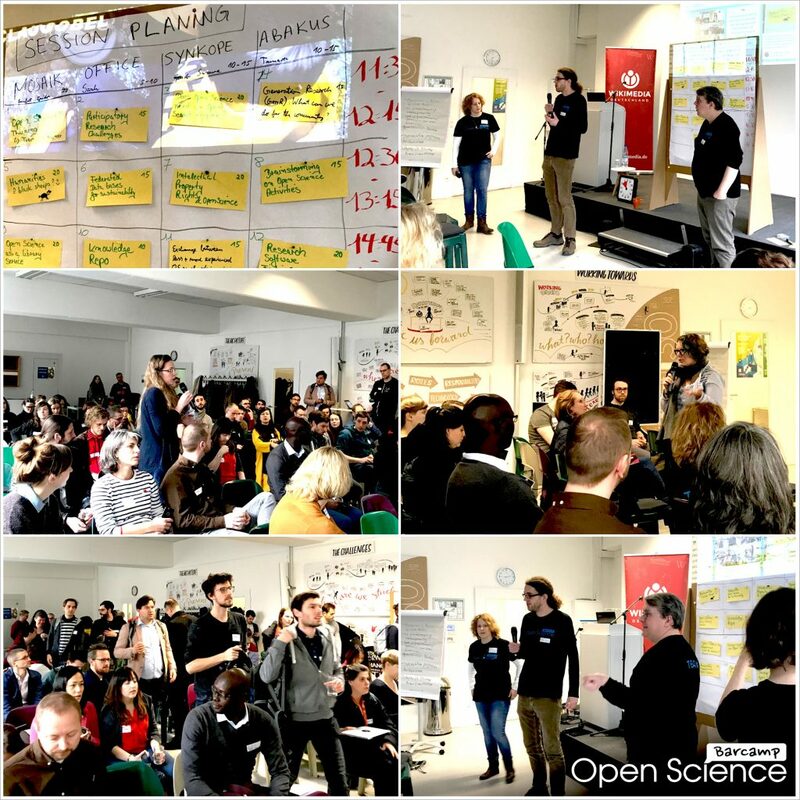 After five successful years with the Barcamp Open Science, the question arose as to whether and how it should be further developed. Lambert Heller and Guido Scherp offered a session on this topic. Basically there was a consensus to change the Barcamp Open Science event as little as possible and to keep it “as barcampy as possible”. After three years in Berlin, however, a stable Open Science community has formed around the barcamp, with participants who have already participated several times. This leads to a gap to people who have only recently started working with Open Science. In order to take this fact into account, there might be special offers for both target groups before or during the barcamp. Newcomers could, for example, receive specific introductions to Open Science. “Speed mentoring” was also discussed. Participants would indicate what expertise they offer or what expertise they are looking for. If there is a match, corresponding knowledge can be exchanged via a short face-to-face meeting. In addition, the Barcamp Open Science can be supplemented by other events. Several barcamps can take place in different cities at the same time or additional barcamps could be spread over the year with changing locations. Cooperation with other events, communities, initiatives, or institutions is also possible. The experiences of recent years and thus the idea of the Barcamp Open Science itself could also be shared, for example in the form of a guide for the organization of a barcamp. Particularly in the context of Open Science, it makes sense to establish low-threshold formats intended for intensive exchange, such as a Barcamp. Researchers have questions and want to discuss them. For this reason, a Barcamp is a useful supplement for “classic” conferences and a good opportunity to bring Open Science further into the different disciplines. In 2020 there will be a Barcamp Open Science again, which will be preserved in its core. However, we will pick up the feedback from the community in order to further develop the format together with the contributors. In addition, we will support other exchange events such as the barcamp. Experience shows that these events are needed. The ZBW – Leibniz Information Centre for Economics is the world’s largest research infrastructure for economic literature, online as well as offline. Opening up Science: Wie öffnen wir die Wissenschaft?